JooYoun Paek is at it again. You may remember her for the unique musical origami she designed. 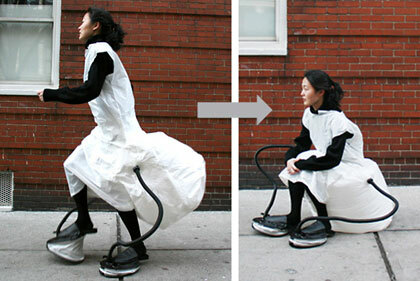 Well her newest creation is a self-sustainable chair… that you can wear. There are a few requirements you must agree to in order to wear this though. First you have to be able to wear a dress. So guys, if you are comfortable with your manhood, by all means, move on to the second requirement. Second, you have to feel fine wearing what is essentially an inflatable garbage bag attached to 2 foot pumps that fill up the bag as you walk. I gotta give it to her for creativity. I know I would of never thought up something quite like that.